Taxpayer supported PBS should at least try and show some restraint during the runup to a national election. But the programing executives do all they can to get Obama/Biden in the White House and complete the project of one party rule in the United States. The media executives at PBS published a survey asking if Sarah Palin was qualified to be Vice President. But there were no such surveys about Obama, Biden or Hillary were there? Here are some examples of citizen journalists remarks buried on the PBS ombudsman Web page. WIll you see this in your daily newspaper? Nah. And the Democratic Party promises to bring back the Fairness Doctrine after they take over the White House. Why do they have to go that far? I am once again aghast and stunned that the PBS would be so involved in politics that they actually circulated the “is Sarah Palin qualified to be Vice President” poll. How dare you use federally subsidized taxpayer platform for your own political ambitions: have you know shame? You code of ethics mentions a “neutral platform” and that means you do not have the right to back a candidate. The poll regarding the qualifications of Sarah Palin would only be put out by a biased, liberal attack apparatus: Everybody else knows that she is well enough qualified to be President, far far more than Obama. It is a moot point and undebateable fact that Obama is not qualified by experience, background or character to be President; yet you have the audacity to question whether the sitting governor of the State of Alaska is qualified. The mere asking of the question is an unethical violation of your own “neutrality” status. As for me; Every night I pray to God that Obama does not reside at the White House. North Korea’s pot-bellied communist leader Kim Jong-il failed to appear at a parade on Tuesday to mark the 60th anniversary of the country’s founding. UPDATE: Kim Jon Il fired his two-stage rocket on April 5. Look out California. Slight of hand. What does President Obama say about it? The U.S. and Russia will work on reducing each others nuclear stockpiles. So? The issue is Kim Jon-iL’s rocket and nuclear weapons program. North Korean leader Kim Jong Il is more impaired from the stroke he apparently suffered last month than reports from the region suggest, and the United States and China are holding talks about what to do if the government in Pyongyang collapses, FOX News has reported. A senior Bush administration official says that although Kim may not be close to death, the U.S. does not accept reports from South Korea that he’s on his way to a rapid recovery. The official told FOX News the United States is naturally engaging the Chinese about what to do if there is ensuing instability in North Korea. – The Kyodo news agency report from the city of Pyongyang. 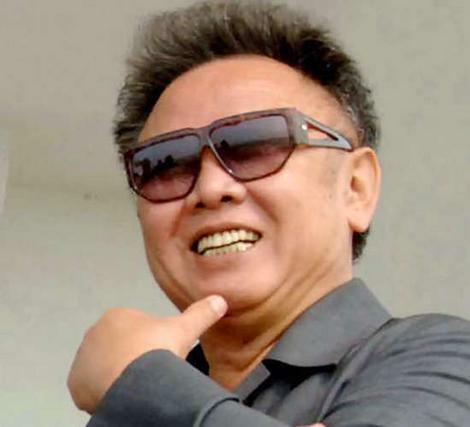 Kim Jong-il is ill. What else is new? We knew that. He's an outspoken supporter of the Democrat Party. Friends of Kim, including pot-bellied Hugo Chavez, hate-filled President Ahmadinejad of Iran, and the Castro brothers are on the phone with North Korea’s embassy, I’m sure. Now is the time for first George Bush, then John McCain and Sarah Palin to help North Korea become free. Another wall comes down. What does Obama have to say? Here is my stab at Obama’s quote to come.